15 Vista Colinas, Rancho Santa Margarita, CA.| MLS# OC19067638 | Southern California Homes for Sale. Search properties Southern California. Absolutely ADORABLE 2 br, 2 full ba condo situated perfectly between the beautiful RSM Lake and Saddleback Mountains is located on the ground level with no steps and the upstairs owner lives out of the area and is rarely there.The entry is enchanting and welcoming with colorful plantings! As you step inside you'll find an open-concept space which includes a large kitchen with tons of storage, freshly painted cabinets with new hardware, stainless steel appliances (fridge included! ), gorgeous granite counters with breakfast bar and new pendant light,dining area with new brushed nickel chandelier, and living room with a cozy fireplace. Down the hall is a full bath with tub/shower and granite counters, guest bedroom with double door entry, and the Master Bedroom with a walk-in closet PLUS an extra closet, and an en-suite bathroom with ample linen storage and updated vanity with glass bowl sink and granite counters. Other features of the home are living room sliders leading to the intimate outdoor space with newer pavers, laundry area just off the kitchen which leads to the direct access 1 car garage with added overhead storage, and solid surface flooring throughout...NO carpet! 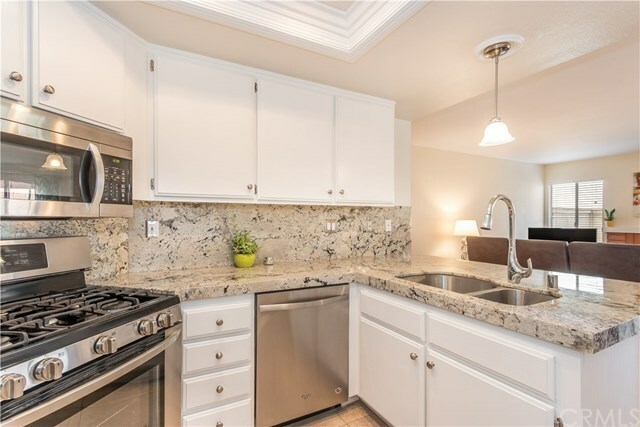 A short walk to enjoy RSM Lake and Beach Club, Shopping and Restaurants, Hiking Trails in O'Neil Park, and Award Winning Trabuco Mesa Elementary. Just steps away is the community pool and spa or enjoy one of RSM's many pools, parks, community center, movie theater, and sports courts! Oh, and NO Mello Roos! Directions: Las Flores to Vista La Cuesta, first left turns into Vista Colinas. Condo is on the left.